A question I get a lot is what separates you from other insulators, or from the builders perspective, “why should I use Best Insulation over any other insulation company. Today I wanted to address some of the difference between quality insulation contractors and, well, not so quality insulation contractors. I will address home owner’s first, builders second. For any homeowner that is interested in purchasing insulation for their existing home I would always recommend to ask for references from the insulation contractor you are thinking about using. 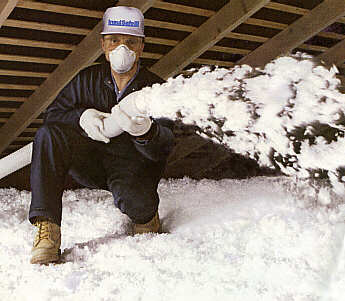 Any company can install insulation in an attic, but the care insulation contractors take while they are installing the insulation is just as important as the insulation itself. Whenever insulation is being added in the attic, the insulation contractor has to use the attic access door. Attic access doors can be located throughout the house, so it’s important when you call the references to ask how well the contractor protected the flooring, the car in the garage, and how well the contractor cleaned up. It’s also important to ask the contractor what their company policy is if one of their workers accidentally steps through the sheetrock. This can be a costly repair, and you want to make sure that the contractor will pay for the expenses if something goes wrong. At Best Insulation we always protect floors, cars and wall corners with plastic as a means to keep anything from getting scratched. Typically insulation will fall out of the attic when we open attic doors. After we are finished we vacuum up any excess insulation that has fallen out of the attic. If one of our workers accidentally steps through the sheet rock (we have never had this happen), we will assist you in finding a sheetrock contractor to repair the hole, and pay for the expenses. What separates quality contractors from not so quality contractors? Most Insulation workers get paid on a sq/ft basis, so the quality of their work suffers because they try to get the work done as fast as possible. What does poor quality work mean to the builder? Holes and or gaps in the insulation, missed wall cavities, missed knee or pony walls, and poor cleanup because the workers don’t make money cleaning. Last but maybe most importantly, the builder could fail inspections which cost time and money. At Best Insulation we reward our workers for completing a high quality, clean job in a timely manner. What does this mean for the builders? They don’t have holes or gaps in their insulation, they won’t have missed walls cavities, and when we always try to leave the job cleaner than we found it. This means the builder passes inspection on the first go around and can transition into drywall with ease. Time is money, don’t let your insulation contractor cost you either, use Best Insulation. Benefits of Spray Foam Insulation for the Texas Heat!